HOUSTON? 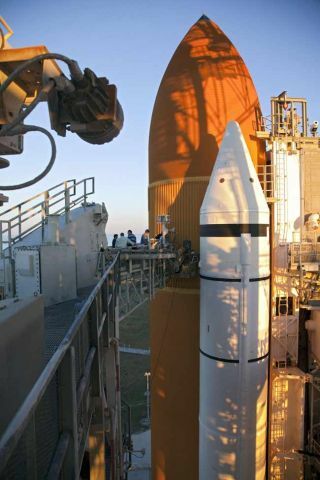 To test a troublesome fuel tank on the space shuttle Discovery, NASAplans tofill the tank Friday morning and run a countdown to what would normallybe itslast few seconds before liftoff. Butinstead of launching the spacecraft on its planned mission to theInternationalSpace Station (ISS), the space agency will halt the so-called "tankingtest" in an effort to learn why two of the fuel tank's support beamscracked during a previous launch attempt last month. NASAis now planning Discovery'sliftoff for no earlier than Feb. 3, 2011 on its final spacevoyage beforethe orbiter is retired. But first, engineers must figure out whatcaused theshuttle's fuel tank to crack. Shuttletechnicians have outfitted the tank'sribbed midsection, or intertank region, with nearly 90instruments,including strain gauges to precisely record movement and temperaturesas thetank chills and warms again during the test's fuel loading and emptyingprocess. Thetest will help shuttle engineers determine if that shrinkage caused two21-foot-long,U-shaped aluminum brackets, called stringers, to crack during thelead-up to aNov. 5 attempt to launch Discoveryon its STS-133 mission. That launch attempt was called off not becauseof thecracks but rather due to a gaseous hydrogen leak that emanated from acableconnecting the tank to the pad. Thecracked stringers, however, caused their overlying foam insulation tocrack as well,which is how NASA initially discovered the damage in the hoursfollowing the foiledNov. 5 countdown. In addition to the cracked beams posing a potentialstructural concern, cracks in the foam could cause the insulation tofall offduring the shuttle's climb to orbit, creating a risk it might impactand damagethe orbiter's heat shield. InFebruary 2003, falling foam from the fuel tank hit shuttle Columbia'sleftwing, damaging its leading edge. The impact ultimately led to the lossof thevehicle and its seven-person crew when Columbia re-entered theatmosphere atthe conclusion of its STS-107 mission. ThoughNASA has encountered cracks in the tank's stringers before, they havealways shownup during its assembly. This was the first time that cracks were foundwhilethe shuttle was on the launch pad, leading engineers to wonder if theymissedsomething during the beams' fabrication or installation. A root causefor thedamage has not yet been found, leading managers to call for the tankingtest. "Theidea is to help us figure out what caused these cracks in the firstplace tohappen, which we haven't been able to do before this round of tests,"NASA'sKennedy Space Center news chief Allard Beutel told SPACE.com. "And alsogetthe data out of it that will help figure out if this could happen againandcould we do something to address that and preempt it from happeningagain." Thetest will provide more information about how the tank performs duringfueling,as well as verify the repairs made to the cracked stringers.Techniciansinstalled new sections of metal, called "doublers" because they aretwice as thick as the original stringer metal, to replace the tops ofthe twocracked stringers. Thecountdown for the test began at 9:00 p.m. EST (0200 GMT) on Wednesdayat theT-minus 33 hour mark. Five planned holds are built into the countdown,whichwill run until T-minus 31 seconds, when during a normal launch,Discovery'sonboard computers would take control. "Tomake this [test] as realistic as possible, they are doing as many reallaunchday activities as practical," said Beutel. "There's some things we'llobviously not be doing ? the crew is obviously hundreds ofmiles away [atJohnson Space Center in Houston] so we won't be doing anything withthem." Fuelingof Discovery's external tank is scheduled to get under way at 7:00 a.m.EST(1200 GMT). The test is expected to be completed approximately threehourslater. Unlessthe foam cracks again, results from the test will not be knownimmediately.Managers and engineers will review the data that the test generatesbeforedetermining the next course of action. Inthe meantime, Discovery will be rolled off the launch pad and back tothe 52-story-tallVehicle Assembly Building, where its tank will undergo X-ray scans toexaminethe stringers. Barring any further problems, the shuttle will bereadied forlaunch. Discovery'snext opportunity to embark on its 39th and finalmission is scheduled for no earlier than 1:34 a.m. EST (0634GMT) on Feb.3. The shuttle's planned 11-day trip will deliver a storage room andRobonaut2, a humanoid robot, to the International Space Station. Two spacewalksalsoplanned.